What is Roll 212 from the Daily Show? For those of us that watch John Stewart’s The Daily Show, already know this, but for those that dont, John has a habit of saying ‘Roll 212’ when he is about to play a clip that will support a point is trying to make; most commonly for showing people who say one thing then contradict themselves later. 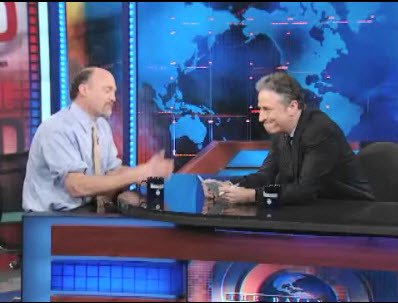 Roll 212 was first used in 2008 when John had Jim Cramer of CNBC in a discussion on CNBC’s contribution to misleading common investors before the stock market fall in 2008. Stewart had started the week with a shot at the predictions of the CNBC pundits over the past year. “If I had only taken CNBC’s advice,” Stewart said, “I would have a million dollars today—provided I started with $100 million.” Towards the end of the Jim Cramer was sent out to try and mull things. ( I guess ) But that did not work. Steward and his crew is normally pretty well prepared to back up any serious joke they make on the show. When John asked Jim about the practice of spreading rumors to drive down stocks when doing a short, Jim ‘basically’ said they really did not occur, to which John replied with a series of clips (208, 210, 212, and 216) from 2006 directly counting what Jim says. “Roll 212″ for some reason stuck. Most likely because, one, Jim said; ‘No, Not 212!” and 212 sounds good. Check out the interview yourself. Despite being a comedy show, this is some of the best journalism around the gaming of the stock market I have ever seen.